Today Apple released their own podcasting application for iOS. This was widely rumoured, though it still seems to have taken a lot of people by surprise. Naturally a lot of people have asked us about how we feel about being ‘sherlocked’ (a fun term dating back to an app called ‘Watson’ which Apple copied, and bundled into Max OS X as ‘Sherlock’). Our reaction to the rumours was of course trepidation and fear, since Apple can play ‘dirty’ and do all sorts of things with iOS apps that we as third-party developers are not allowed to do. The app that they released today though, made us very happy. Apple’s app is quite pretty to look at, and it does a nice job of separating podcasts out of iTunes so in that sense they’ve done the podcasting community a great service. Once you play with their app for more than 5 minutes though, you realise it’s little more than that. It’s literally the features they once had inside the Music and iTunes applications bundled into iOS, moved into their own application. As the maker of a podcasting app, we realise this sounds dis-ingenious, so please, allow us to elaborate. There’s a 50MB limit on downloads over 3G. 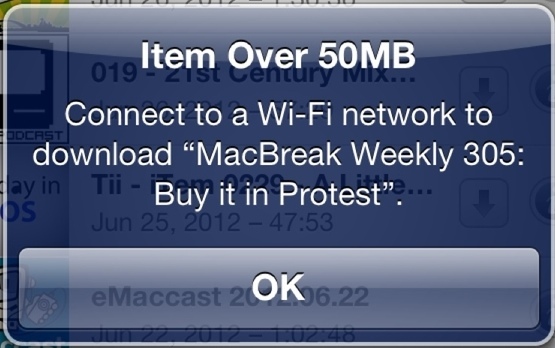 Case in point Macbreak Weekly came out today, it was 50.3MB. Can I download it? When I play a podcast, I like to be able to see where I’m up to. The now playing screen Apple has is pretty, but doesn’t tell me that. You can tap the artwork to get a progress bar but even that doesn’t have times on it, you actually have to start scrubbing to get them. Once you do the times stay, but they don’t update at all…which seems a bit silly. Where am I up to? How long is this podcast? I like to be able to skip adverts really quickly. Apple has a skip back 10 seconds, skip forward 30 seconds. That part would keep me reasonably happy, except the buttons are too close together, and I’d struggle to hit them accurately in my car, which is where I listen to podcasts for over an hour a day. I also listen to podcasts that don’t come out on a regular basis, and I’d like the app to send me updates when a new episode comes out, the Apple app can’t do that, I have to open it to get it to refresh. Now I know what you’re thinking. “You’re purposely focussing on all the things you’re app does well, because you want to point out how great it is. That’s not fair”. You’re right, and you’re wrong. We built our app because we’re avid podcasts fans. We spent a long time agonising over all the little details that we wanted in an application to make our podcast experience pleasurable, rather than painful. So yes, the Apple app is missing things our app has, and yes I’ve pointed out some of them, but for good reason: these are all features we wanted, nay, demanded. Server side podcast parsing. Now this is something as a user I wouldn’t think I’d need, but being able to update all 30 of my podcasts in 1 second, vs 1 minute for Apple’s app saves me bandwidth and time. We’re also the only app in iOS to do this. Being able to play a video podcast, as audio. All to often I download a video podcast, but then want to play it while doing something else on my phone. The Apple app stops the video the second you back out of it or press your home button. Pocket Casts automatically switches to playing the audio from the video file, allowing you to keep listening. Being able to play a podcast while it’s downloading is also very handy, it means you get the best of streaming and downloading. So this morning I was dropping my son off at school, and a new Macbreak Weekly came out. I was out on 3G, so I just tapped download before I hopped back in the car, about 20 seconds later it’s ready to play, and I get to keep the file afterwards so I don’t need a network connection next time I go to play it. Update: I’m told Apple’s app actually supports a slight hybrid of this mode. Where it will stream and download at the same time, then switch to the downloaded version when the download is done. I can’t confirm this, but you’d still be out of luck if it’s over 50MB and you’re on 3G, just like I was in the example below. Variable playback speeds (1x, 1.2x, 1.5x, 2x) – Apple has just slow, normal and fast. Playlist, choose the order in which you want to play your episodes. Handy when you’re on a plane. Queue up some episodes in the order you want, put your headphones in and your phone never needs to leave your pocket. Show notes, one of the most crucial parts of listening to any podcast, and yet as far as I can tell Apple has left them out completely. Handy Settings: want to delete a podcast automatically when you’re done. No sweat. Want to configure how your headphones should work with the app, Pocket Casts can do that too. Apple’s app is locked into triple tap to jump back 10 seconds, double tap to skip to the next podcast. In Pocket Casts we have the more sane default of having double-tap skip forward, which is a lifesaver for skipping adverts when you’re phone is in your pocket and should you choose you can have the headphones skip whole episodes instead. Manually add shows: every now and again you’ll come across a podcast that isn’t in iTunes. In Apple’s app your out of luck but in ours you can paste in the feed URL and be on your way. When we started building Pocket Casts well over 2 years ago, we were very confident that Apple would make their own app one day. We were also very confident that they would keep it clean, minimal and give it a feature set that would only appeal to casual podcast listeners. In our eyes that’s exactly what they released today, it’s a great application but it’s really not what we as podcast fans wanted. We made many design and implementation decisions (like server-side podcasting parsing) in the early days for this very reason, to stand out head and shoulders above what Apple would release. So to the question “Are you worried that Apple has killed off your app” we honestly answer: “Not really, if anything we hope this drives more people to using podcasts exclusively from their phone, and then once they get frustrated prompts them to look around for better applications”. Only time will tell, but today alone our sales are 2x higher than this time last week, so it could well be that a rising tide lifts all boats. If you’re serious about podcasting, I’d take our app over Apple’s any day of the week…but why take our word for it, grab the free version or the paid one and try it out for yourself. Great response. Honestly, I don’t know if I would have bought your app had Apple’s one been out a year ago, but I guess I don’t have to worry about that, because I already have it, and will continue to use it until something comes along with features that I prefer. What do you say to the rumours that they might use their podcasting app as a test for automatic downloading? Might that give them a leg up over Pocket Casts, at least until that feature is given to third party developers? I can definitely say that’s a feature I would like to have. On another note, are you aware of any podcasting app called simple “Casts”, because if not, I think Mr Ihnatko may have given you a small plug in this week’s MBW. Give me Apple’s UI and your server-side updates and notifications and I’ll be happy. I put up with your UI but honestly…I hate it. Hi Russell. I’m a big fan of your app. I have the paid version and use it every day. However, I feel you have provided inaccurate information about some features in Apple’s Podcast App. – you claim they only have normal and fast playback speeds. They also have slow playback. A feature your app doesn’t have. – you tout your setting for keeping/deleting episodes per feed. Apple’s App also has per feed settings allowing you to keep all, unplayed or last 1, 2, 3, 5 or 10 episodes. – you tout Pocket Casts ability to stream and download an episode at the same time. Apple’s App also allows this. Tap download on an episode, then tap the episode name to play as it downloads. It seamlessly changes to downloaded version as well. I even switched to airplane mode while playing to test. – you say it doesn’t show elapsed time or time remaining on playback progress bar by default. For me this has not been the case. Perhaps the file you tested with was an unusual codec and it wasn’t reliably getting info. Perhaps a little buggy, but the feature is there in my testing. Again. I love your app. Especially quick refresh times and notifications. I will still use Pocket Casts daily, but wanted to point out what I felt were misrepresentations of what Apple’s App offers. That is not right: You can paste a feed URL in apples podcast app right into the search field. Ben: thanks for the feedback. We had no ideas about some of those things, so I’ve updated the post to reflect that. Mine still won’t show accurate progress for any of my podcasts, and it’s still hidden by default, so I’ve left that part as is. I tried to use Apple’s app but it seems buggy as hell! Other than that, the interface of apple’s app is nice (i would say on par or a bit better than pocket casts) but pocket casts already had by far the best interface around. On the other hand, with pocket casts is easier and faster to do everything you want to and it has more far more options. Also the fact that you get no push notifications with apple’s app for new episodes is strange, especially considering that they have auto downloads enabled. Also I assume that the apple’s app could sync through iTunes in the future so it can be useful to be able to listen to your stuff from everywhere, which is something that pocket casts will never be able to do (i think). Couldnt agree more. I’ve been using your app for quite a while and love it. 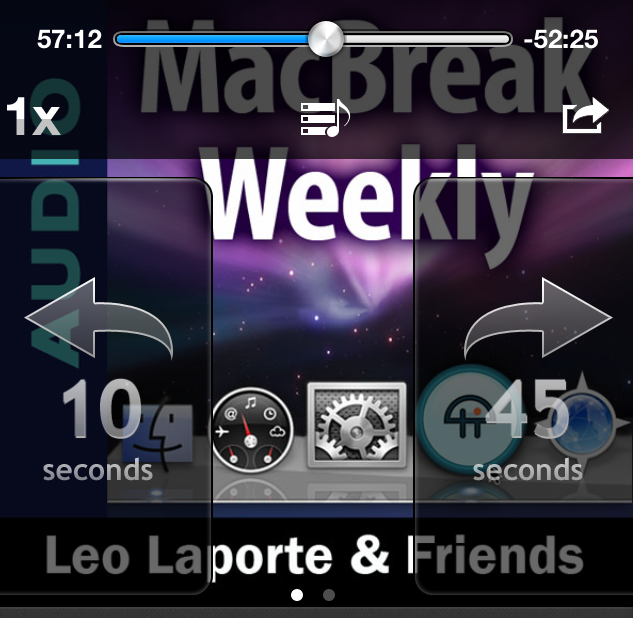 Gave the new podcast app a try just because I wanted to try the syncing features. I listen to podcasts on an iPhone, computer, and iPod and it would be nice if they synced up. The app doesn’t even do this at all, it’s a joke. It is buggy at the moment. Hope that the developers will release updates soon.